What a great response to this round of Cook The Books! It seems like everyone fell in love with "The Last Chinese Chef" by Nicole Mones and that we all wanted to be cooked for and fed by Sam! In reading all of your posts it seemed that everyone responded to something; the food, culture, romance, Maggie's self-discovery, the excitement of whether Sam would win the cooking competition and the book within a book "The Last Chinese Chef", written by Sam's grandfather. What fun to see all the different interpretations of the book come out in the dishes it inspired. I am happy to just be doing the round-up and not have to pick the winner. I think our wonderful author and acting judge, Nicole Mones is going to have a difficult time deciding on just one entry! So without further ado, let's take a journey to mysterious China and feed our souls with some delicious food! Glennis from Cantbelieveweate's Weblog says, "A few pages in I found myself lost in a fog of imagined aromas (chicken and five spice for the most part, but with ginger and garlic wafting through on a magic carpet of braising pork). I love good Chinese." She created her Twice Dressed Beef Under Snow saying, "So I was inspired to think about layers of flavors…perfect little bites…each bite tasting exactly the way I want it to. Lying atop a bed of shredded iceberg & hearts of romaine lettuce lightly dressed with a teriyaki-inspired dressing are marinated and grilled broccoli, carrots and cauliflower along with bites of very rare seared beef. The salad greens were shredded and hand-tossed in a bowl with the dressing, then plated. The veggies went straight from the resting plate to the salads. A few fresh-from-the-garden cherry tomatoes were added because tomatoes go well in salads! The meat was grilled, rested, carved, cut into bite sized pieces, dressed again and plated. Snow, in the form of fried bean threads was added to the plates for contrast and crunch at the last moment." Although initially she thought the book might not be for her, Betherann of Kitchen Courage changed her mind upon reading it saying, "Mones writes with delicate and luscious detail, both about her characters and some truly exquisite Chinese cuisine. I could virtually taste every dish that Maggie, the food writer, samples, and share her delight with each new experience." Betherann tried her hand at a Chinese-inspired Book Savvy Stir-Fry in Almond Sauce. "I'm not sure how Chinese my stir-fry dish really is, but it did hit a sweet spot. This dish reminds me of the mountains of stir-fry we helped make while serving at a Malaysian soup kitchen. There, the master chef threw tons of bean sprouts, tofu, onion, and chicken into a vast, sizzling wok and turned out plate after plate of a hearty meal which we served to the waiting poor and homeless. I threw together my own version of his stir-fry-for-a-crowd as yesterday's lunch, and it was exactly what my soul and stomach needed. And that, I think, it what a lot of Chinese cooking is all about." Being a self-proclaimed "food-obsessed reader with a voracious appetite for good food and entertaining reads," Arlene at The Food Of Love says, "More than any of the other books we've read in the past, this novel resonated with me. 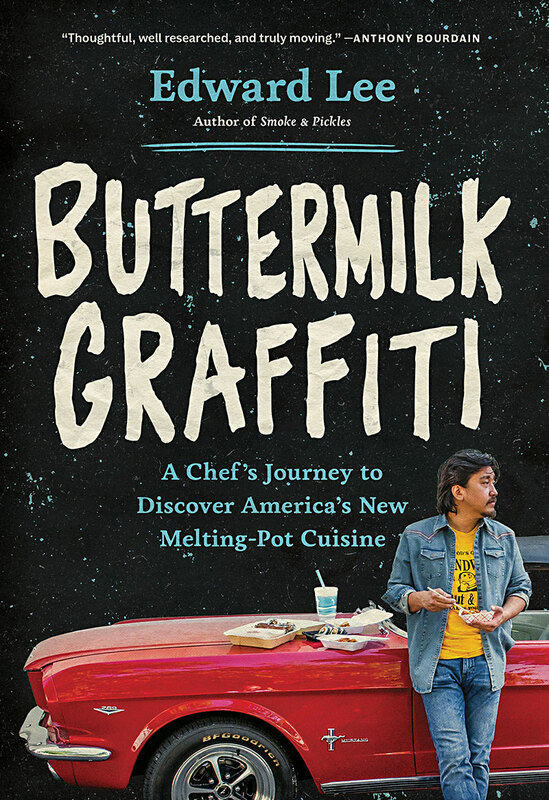 My premise that food is how we show our love for family and friends was echoed in this story of a food writer and a Chinese-American chef. ...Not having access to many of the regional recipes alluded to in the novel, I determined to cook something that would use the freshest ingredients in a simple way, but in a way that would focus attention on the essence of the ingredients. After literally hours of searching through my cookbooks and the internet, I decided to try to replicate a wonderful dinner I had just recently at a favorite restaurant, Steamed Lobster in a Scallion Ginger Sauce. It was a delicious dinner and far more economical to eat at home than at a restaurant. While I still dream of eating lotus leaf spare ribs and beggars' chicken and sesame cakes, I will have to content myself to the far more pedestrian fare available in New York." Suzie from Munch & Nibble made an entire Chinese Supper for her CTB post. She says, "When it came to choosing a meal to cook inspired by this book, I had lots of thoughts on what I wanted to achieve: I wanted to illustrate "guanxi" or relationships and connectedness because I was cooking for my family. I decided to make the Poached Chicken that Sam makes for Maggie early in the book. When Sam made this chicken, he reached across the usual journalist / subject divide and paved the way for their friendship to develop, as well as setting her on the path to healing. Maggie says "It was as soft as velvet, chicken times three, shot through with ginger and the note of onion....I may never have tasted anything so good." I had to have a go at it! I wanted vegetable dishes to complement the chicken. I chose Braised Soya Beans which were in Kylie Kwong's book "My China" as a Beijing dish, and are therefore hopefully true to the sort of thing that Sam would make. Soya beans are also symbolic of the continuance of society (more guanxi). The Snowpea and Garlic Stir Fry introduces the colour of jade to the table, while snowpeas are a Chinese symbol of unity, and garlic symbolizes luck and health. I wanted to make a reference to a Chinese fable, as many of the book's dinners referred metaphorically to literature as well, and so I chose the story of the Moon Lady, Chang Er. We ended the meal with Ginger Cookies in the shape of a moon with a little speck of candied ginger to represent Chang Er sitting on the moon." Foodycat says, "Putting together my contribution for the latest Cook the Books was challenging. 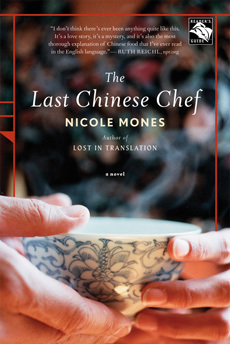 Nicole Mones' novel, The Last Chinese Chef has many layers - there is cooking (of course), there is grief, love, dispossession, betrayal, nostalgia - the whole box and dice. One aspect of the book that I really loved is the lack of a villain. It would have been quite easy to write a scheming woman pursuing a paternity suit, or rival chefs plotting sabotage. But Mones has avoided the facile and has given validity to conflicting motivations. Where disaster strikes, it isn't through enemy sabotage, it is through the agency of a much-loved uncle. I wanted to do justice to the book by having a many-layered menu and somehow show some of those themes in my food." Inspired by the planning Sam goes through for the competition in the book, she came up with an entire gorgeous feast; a Vegetarian Appetizer Platter, Pigeon Sang Choy Bao, Trotters in Black Vinegar, Spring Onion Flower Rolls, and Lapsang Souchong Panna Cotta with Star Anise Plums. Here are a couple of the pictures but go visit her post to see the rest of her dishes. Combining her love of all things pasta with inspiration from the food descriptions in the book, Joanne from Eats Well with Others made Shredded Piquant Pork With A Red Bean Surprise. Joanne says, "I enjoyed reading about Sam's endeavors in the kitchen as well as his description of the theory behind traditional Chinese meals. There are so many aspects to take into consideration that no food is ever as simple as it appears...there are surprises behind every bite. One recipe that I kept coming back to was one for a local dish of shredded pork in piquant sauce that was served in a tofu wrapper. After some googling around, I came across a recipe for Mandarin Shredded Pork and Sweet Bean Sauce. This seemed piquant to me! What I liked about this dish was that one looks at it expecting it to be savory and then bites into it, only to be met with a delicious and unprecedented sweetness. The pairing of the red bean paste, which is almost always associated with desserts, with the pork is one of those suprises that Sam talks a lot about in the book. I also decided to put this over pasta because, well, I like pasta." Maria of Organically Cooked says, "Authentic Chinese cooking uses the same kind of locally grown or foraged produce that local Cretan food uses. Moreover, due to the sharp rise in the numbers of resident foreigners in Hania, Asian bottled sauces and fresh root ginger are now being stocked at most supermarkets all over the town; had I been making trying to cook authentic Chinese dishes in my Mediterranean kitchen a few years ago, it wouldn't have been possible to find ingredients like oyster sauce and chili paste. "I decided to cook a common-looking Greek meal in our house using Chinese flavours, something that I knew the whole family would enjoy, introducing, in a subtle way, the flavours of a foreign culture into our house, whose food customs are not at all as foreign as they sound. My experiments in Asian cuisine do not look very Chinese; only if one can smell the food will they realise that this is Asian cuisine - otherwise, it looks very Cretan." Maria's meal included Stuffed Squash Flowers with Chinese Flavors, Goat Meat Wrapped in Vine Leaves, Yangshuo Country Eggplant, and Asian-Flavored Souvlaki. Here are a couple of photos, the rest can be found in her wonderful post. Heather of girlichef loved the book and says, "I'm pretty sure I wanted to try each and every single bit of food that was mentioned throughout this book. But the one that I have not stopped thinking about was Pork Spareribs in Lotus Leaf. I was bound and determined to make this and knock all of your socks off. When Sam loving and painstakingly works on perfecting these...I can feel my cheeks starting to tingle and my mouth begins to water." Although Heather was able to make her own rice powder scented with 5-spice, she had a little trouble sourcing another key ingredient, "Do I even need to tell you that I could not locate Lotus Leaves. Anywhere. Ugh. Okay, switch gears...but just slightly. I ended up making a salmon dish that was totally inspired by my desire to try the Pork wrapped in Lotus Leaf." It all worked out in the end and she ended up with a lovely Salmon Wrapped in Banana Leaf instead. Heather says, "This is a meal I will be making again...and don't worry, I'm not giving up on the Pork wrapped in Lotus Leaf! I have some scented rice powder just waiting for my upcoming trip to the Asian Market. Now, are you writing another foodie novel Nicole? Because I want to be early in line." My fabulous co-host Rachel, The Crispy Cook says, "I devoured this lyrically-written story in two sittings, and went back several times to savor the various passages I had festooned with bookmarks. It was a love story of many dimensions: between a man and a woman, between father and son, uncles and nephew, between old passions and new ones. Mones introduced me to many things about Chinese culture. She weaves many concepts about cooking and history into her story." Rachel used several different sources of inspiration to create her feast, the novel of course, "The China Moon Cookbook" by Barbara Tropp and the classic Chinese foodie movie, "Eat Drink Man Woman". She ended up with many wonderful dishes, Strange Flavor Eggplant on Toasted Baguettes, Rainbow Vegetable-Noodle Salad with Chili-Orange Oil, Steamed Rice, Sliced, Chilled Suyo Long Cucumbers, and Dragon Well Shrimp and Steamed Red Noodle Beans. Here are a couple mouth-watering photos, check out her post for even more. Simona from briciole was inspired to make her Corn Soup with Tofu and Tomato by the scene where "the platter of "plain food" prepared as part of the banquet menu lands on the floor, a mishap that destroys the carrier of the flavor of 30 crabs What intrigued me was the concept of tofu boiled until it becomes spongy and able to absorbs a sauce, crab reduction sauce in this case. The guest thinks he or she is eating plain tofu, but at the first bite, the unsuspecting taste buds get a jolt. Making a reduction sauce from 30 crabs was outside my range of possibilities, but I thought this would be my chance to finally do something I had never done before: prepare a dish with tofu as one of the ingredients. The four ears of sweet corn I found in this week CSA box provided another inspirational element to the enterprise. I had just made some vegetable stock using corn cobs... so the idea of corn soup took shape in my mind. The question was: would spongy tofu soak up creamy corn soup? The result? "I am happy to report that the soup was excellent. The spongy tofu experiment did not work as expected, but that detracted nothing from the dish. Tofu added texture without cluttering the flavor space, which was dominated by the roasted sweet corn, underlined by the fresh herbs and complemented by the tomato." Natashya from Living in the Kitchen with Puppies enjoyed the book, finding it to be "an adult adventure and romance that rises out of the sudden widow-hood of a childless food writer and her subsequent trip to China. There she takes part in the dual projects of investigating a paternity suit against her late husband and covering the story of a Chinese-American chef who is competing for a place in the Beijing Olympic culinary competition. A tapestry of food and history unfolds in this book that delights the senses as well as the heart, a wonderful summer read." Natashya chose to put her wonton making skills to good use to make a delicious, cozy dinner for her family. She says, "For my cooking selection, I chose Beijing Wontons in Rich Broth. A delicious meal that my family loved. Enjoy!" My other wonderful co-host, Johanna of Food Junkie Not Junk Food says, "I read the book in three days, as it is a real page turner. The plot is classic love story, but at the same time an in-depth look at Chinese food culture. I was mesmerised by the attention to detail and the philosophy behind this type of cuisine which is so largely unknown outside China. Used to the formulaic cooking of western Chinese restaurants, we have lost all the glory and subtleties of a type of cuisine that goes back thousands of years.I chose to cook something very simple, as Chinese cuisine greatly believes in simplicity, as much as in the complexity of things. It is a Steeped Chicken, that the American-Chinese chef in the book, Sam Liang, cooked for Maggie, the food writer, as a way to heal her grief. I thought this dish was pure brilliance, as it requires minimum effort and gives extremely moist and fragrant results. I am not in such a terrible emotional state as Maggie, but the plump chicken pieces, together with all the aromatics made me fuzzy and warm inside. The broth is wonderful too. I will be using it in a soup very soon!" It took Claudia from Honey From Rock a lot of experimenting in the kitchen before she came up with her final dish for CTB, Sichuan Tofu with Vegetables. She tried a Lotus Wrapped Sticky Rice but found that it was, "Good, but not quite up to our Last Chinese Chef standards. And, I couldn't honestly say the lotus taste was distinguishable." Next she tried to get the right spongy texture of tofu, "experimenting over the past month or so, with pressing the water out, then freezing, pressing the water out and boiling and pressing again, etc. etc., but still not achieving the desired sponge effect." Finally, with advice from a local health food store owner, she froze the tofu block without pressing the water out and she says, "BINGO! to use an old expression. It woiked" About her final dish, Claudia says "I call it Sichuan because of the spicier ingredients in my sauce, typical of Northern Chinese or Mongolian style cooking. Served with a slice of tropical white pineapple on the side, and some brown rice, what a delicious meal this made." Although she went through some "trials and tribulations" to get a copy of the book and make her dish, Judy from Judy's Gross Eats, got it done. She says, "This is an awesome love story in every sense: love of country, love of food, love of history, and love between two people. I never wanted this story to end. It was inspiring.I started a search for a recipe that would engage the senses and related to the setting of the story. After perusing several cookbooks on Chinese cuisine, I chose Hangzhou Braised Pork from The Shun Lee Cookbook by Michael Tong. I did adapt it to the ingredients I had on hand. This led to my second 'trial and tribulation': the cooking liquid is supposed to be boiled down to make a syrupy sauce. Even though I boiled 3 times as long as the recipe stated, it never became syrupy. I decided I would try again when I reheated the leftover pork, but I was once again thwarted. My daughter beat me to it, eating all of the remaining meat and rice, without spinach and without sauce. She declared it was delicious and I should make it again. All that's left now is a container of sauce, waiting to be reduced. Guess I'll have to make it again." Finally, over at Kahakai Kitchen, I decided to try my hand at Congee, after reading Sam describe it in the book, "Congee. It's the simplest food, the most basic. But it takes care. It's like love". I had never been a congee fan but was ready to change my mind after reading about the thick rice porridge and all of the toppings, "He gestured to at the side counter, which was crowded with little bowls he had been preparing while the aromatic rice was cooking. There were tiny squares of crunchy pickle, slivers of greens, velvety cubes of tofu, tiny smoked-dried Hunan fish mounded up in a crispy, silvery tangle. There were peanuts, shreds of river moss, crunchy soaked fungus, and matchsticks of salty Yunnan ham." And change my mind I did, it was the perfect comfort food and although I couldn't exactly replicate Sam's congee, I ended up with a dish I really liked. Thanks to everyone who joined us for this round of Cook The Books--you all really outdid yourselves. (I found myself drooling as I wrote this round-up!) As I mentioned before, I do not envy Nicole and the decision she has to make! I'll be back in a few days with the name of our winner for this round who will receive the coveted Cook the Books Winner's Badge for their blog and a place on the CTB blogroll. In the meantime, you can get a head start on our next book, Peter Mayle's "French Lessons: Adventures with Knife, Fork and Corkscrew", which will be hosted by Johanna. More details on "French Lessons" and the announcement of our next three books will be coming soon. This is Deb from Kahakai Kitchen, just popping in to say that I hope you all are enjoying our lastest CTB pick, "The Last Chinese Chef" by Nicole Mones. I for one, have been learning a lot about the amazing history and culture of food and cooking in China and am dazzled by thoughts of what to make for this round which ends on August 28. In this foodie novel, a recently widowed American food writer finds solace, love and of course incredible food during a visit to China to clear up a paternity claim against her late husband’s estate. Her editor gives her an assignment to profile a rising star chef, Sam Liang and she is drawn deep into China’s culinary world, learning and being transformed by the cuisine, Sam’s colorful family and Sam himself. As a companion to the book, here are some links that you might find helpful and interesting. Nicole Mones website with information on the author and her books. For Food Lovers: Where to eat in China as well as descriptions of the food and recipes cooked in the book. Remember you have until Friday, August 28th to read the novel, cook a dish inspired by the book and post it on your blog. No blog but still want to join us?! No problem, just email me (debinhawaii@gmail.com) and send me your write-up and pictures and I'll post them for you! Everyone is welcome! We can't wait to see the amazing dishes you come up with! We are still on track for our current CTB selection, "The Last Chinese Chef" (remember the posting deadline is Friday, August 28th). If you didn't see the previous post with an update about our guest judge and the wonderful recipe resource she provided, check it out here. Some of you speedy readers may have finished the book already and might be looking for the chance to get involved in other foodie book events so we wanted to let you know about a fun opportunity that you may be interested in participating in. Cook The Books and our participants are not alone in our love for combining reading, cooking and eating! Bloggers Cath from A Blithe Palate and Stephanie from Dispensing Happiness have created an event called "The Edible Word" and have invited Cook The Books to help host it and also give some of our participants an opportunity to join in the fun. They are holding aside 7 books specifically for Cook The Books participants--how wonderful is that?! The Edible Word is reading "Confections of a Closet Master Baker" by Gesine Bullock-Prado, a former Hollywood executive who flees Hollywood to become a baker in Vermont. The book traces her baking journey as it sustains her through various life trials; the Hollywood machine; her mother's illness; the wonky life in a sweet, odd small town. Pick a dish that she mentions in the book or an ingredient that she talks about. Post an entry with a picture to your blog and share with us what compelled you to pick that particular dish, and any history about the recipe you created or are using to make that dish. Look for the event on September 5 and the round up on September 7! We have set aside 7 books to share with interested Cook The Books participants. If you would like to join this food blogging event, please send me an email at ablithepalate@gmail.com with your snail mail address by noon EST on Wednesday, August 5 and I'll have Hoss randomly select 7 lucky readers to join us. If you don't have a food blog but would like to participate, I'll be happy to post your blog entry. (Please note that you are a Cook the Books participant in your email). So if you are interested in participating and can fit another book into your reading, cooking and posting schedule, contact Cath at the email above by the deadline and don't forget to let her know you are a CTB participant!.